Welcome to the world of cross-platform convergence, Apple. Come on in — the water's fine. Well, gang, it's official: Cross-platform convergence is now both magical and revolutionary. Apple, in case you haven't heard, is taking a serious step toward bringing its mobile and desktop platforms together: At its annual Worldwide Developers Conference adjective-shouting extravaganza this week, the company announced a plan to let developers bring iOS apps onto MacOS starting next year. So, yes: That means the Apple faithful will soon be able to run iPhone-like software on their regular ol' keyboard-packin' computers. Pretty spiffy idea, right? Mobile software, on the desktop! Just think of the possibilities. But wait: Why does something about this seem so eerily familiar? Oh, right — because it's exactly what we've been watching take shape with Android and Chrome OS over the past several years. Now, before you grab the nearest suit of armor and novelty foam sword, hang on: I'm not here to play a game of "Who Did It First?" Let's be honest: That kind of talk is pretty tired at this point. Some years, Apple borrows heavily from Google; some years, Google borrows heavily from Apple. Sometimes, the inspiration-lifting is for the better, and sometimes, it's for the worse. I'm not an intellectual rights attorney (thank goodness) — and from a normal user's perspective, the arguments over who copied whom are equal parts boring and irrelevant. What I do want to discuss is how much Apple's move validates the approach Google's been pursuing for some time now — and, at the same time, how its implementation of the idea is both similar and simultaneously different. For Google, the notion of bringing two platforms together was nothing short of transformational. Chromebooks had traditionally been cloud-centric computers — a model that provided some enticing advantages over traditional PCs but required you to rely mostly on web-based software like Google Docs and Office Online. Realistically, that sort of setup was more than sufficient for the vast majority of modern-day computer users, but it also left a fair number of gaps in what a Chromebook was able to do. Beyond that, it essentially created a whole new category of device — the Chromebook/Android mashup. That's something we've seen progress considerably over the past couple years, as the hardware has slowly caught up with the software and convertible Chromebooks have effectively become the new Android tablets. And last but not least, it created an ecosystem like no other. Developers could build and publish a single app and have it be available to the world's largest mobile platform and the world's increasingly dominant desktop computing environment. As long as the apps are built with responsive design and with a handful of form-specific optimizations in mind, it's a single, streamlined process with minimal extra effort involved. Significant as those first two points may be, we can't underestimate the value of that last one — the ecosystem expansion. Remember, Chromebooks are hugely popular, particularly in schools. And developers tend to go where the users are. For the first time, Google could actually overcome its chicken-and-egg problem and have an existing audience that'd entice developers to craft large-screen-optimized apps — apps that, by their very definition, would straddle the lines of two overlapping ecosystems and benefit Android and Chrome OS alike. Apple's approach is a bit different. Unlike Chromebooks, Macs already run traditional desktop software. Unlike Google, Apple already has a successful tablet platform. And unlike Google, Apple doesn't currently offer touch-enabled Macs — another one of those classic "it doesn't work" declarations from Steve Jobs, way back when — and even if the company does eventually come around to rethinking that stance, it doesn't seem likely that it'd look to phase out or de-emphasize the iPad anytime soon. 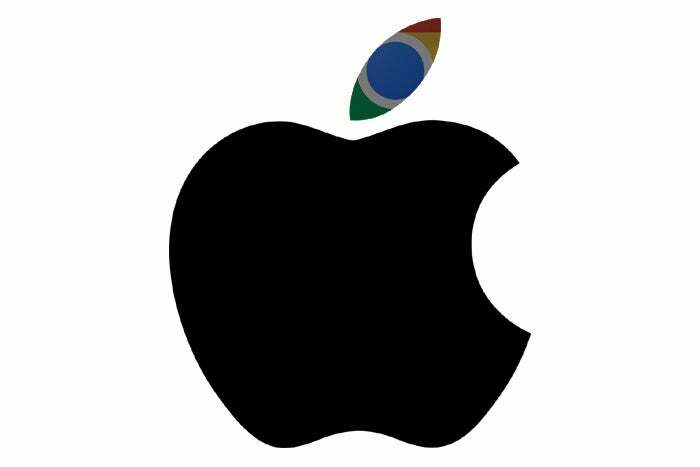 What Apple does share with Google, however, is the ecosystem part of the equation. Apple is all about the ecosystem, in fact, and it has been for a very long time. Google is the relative newcomer to that kind of focus. So Apple, like Google, stands to benefit by aligning its platforms (a familiar phrase, no?) and making them more similar from a user's perspective. It's no secret that people adore their iPhones and the apps associated with them. Making MacOS follow iOS's lead in some ways and allowing users to run familiar mobile apps within it will make the Mac feel more consistent and connected with the iPhone — and thus could make it more appealing both to current users and also perhaps to those who don't presently own a traditional laptop or desktop computer. Apple, like Google, could also benefit from energizing its desktop software ecosystem and giving developers added incentive to focus on that form. It may not be entirely comparable to Google's Chrome OS situation, but the idea that development on the desktop side of Apple's ecosystem is stagnating compared to the mobile side is a pretty common theme of discussion these days. Bringing iOS-like apps onto Macs could go a long way in reversing that view. Perhaps most critically, aligning the ecosystems provides yet another piece of ammo for the famous "lock-in" weapon: You've got the environment you know and love and the apps you know and love on your iPhone and/or iPad — and now on your Mac, too. Just like Google is aiming to accomplish with Android phones and Chromebooks, our investments in these ecosystems are more expansive than ever — which, of course, means we're more likely than ever to stick with whichever ecosystem we choose and continue to buy its associated products year after year. Interestingly, Apple and Google also share the same persistent view from pundits that "the two platforms must be combined!" — a view that no level of adamant denial or ongoing evidence to the contrary seems able to extinguish. One thing the two companies don't fully share is the specific approach to bringing mobile apps onto the desktop. Google, fitting with its general ethos, has established a bit of a free-for-all with Android apps on Chrome OS: By default (unless a developer explicitly disallows it or an app is inherently incompatible due to hardware requirements), most any Android app can be installed on a Chromebook. The Play Store you get on a Chromebook is quite literally the same Play Store you get on a phone. So everyone is in, more or less — and it's then up to each developer to optimize an app and make it excel in the large-screen, keyboard-and-trackpad-using form. Or not. Most apps work well enough on a Chromebook out of the box, and in some scenarios, it's clear a developer went the extra mile to really make the experience shine. Either way, you can find plenty of useful titles that add meaningful value to the Chrome OS environment. From the sounds of it, Apple is taking the exact opposite approach: The door will be closed by default — and the MacOS-iOS collection will consist only of apps optimized for the traditional computer form. That's why Apple is releasing only its own iOS apps for the Mac to start and will be working with developers to optimize their apps for the desktop over the months ahead. "There are millions of iOS apps out there, and some of them would be great on the Mac," Apple Chief Shirt Unbuttoner Craig Federighi noted during yesterday's announcement. The emphasis there is mine, but the message is clear: The entire App Store won't — and, in Apple's view, shouldn't — be coming to the desktop. So which approach is better — Apple's or Google's? The reality is that each seems to have its own set of pros and cons, and it's tough to label either one as a definitive "winner." Google's implementation brings a massive number of new applications into the desktop environment and then puts the onus on the developers to make the experiences shine. The result, as we've established, is a bit of a mixed bag: You have tons of possibilities, many of which are valuable (with or sometimes even without form-specific optimizations) — but you also have apps that are just plain clumsy and out of place. Apple appears poised to offer a more strictly curated selection of apps, allowing only those with form-specific optimizations into the mix. That should create a more consistent level of quality and experience, which is obviously a good thing, but it'll also mean some apps that might be more mobile-specific and not likely to be optimized probably won't become available. Who cares? Well, consider one example: Apps like Netflix and YouTube are readily available via the web and don't seem like the types of titles that'd receive the full desktop optimization effort or the Apple stamp of "great on the Mac" approval. But running the mobile apps on the desktop gives you the unique advantage of being able to download videos from those respective services for offline viewing — a handy little loophole crafty Chromebook users have certainly come to appreciate. When you stop and think about it, the differences here are very much analogous to the differences in the two companies' broader approaches to mobile app distribution: With Apple, you get a more closely controlled selection, which forces developers to comply more closely with guidelines and (in theory, at least) creates a more consistent experience. With Android, the less closely controlled gates mean more variance in the level of experience within — but that also means the door is open to more advanced and interesting types of creations that wouldn't make their way past Apple's gatekeepers. I think most reasonable people would agree that Google could stand to gain some of Apple's quality control and ability to get developers to follow its lead, while Apple could stand to loosen things up at least a little and allow some different types of tools into its closely walled garden. Neither scenario is perfect, but both serve to accomplish the same goal — one that, in this wild new cross-platform world, seems both sensible and inevitable, regardless of which ecosystem you prefer.